*cheers the Cephalopodmas tree* I have the same giant squid. I have the same giant squid. Doesn't including the Elder Sign ensure that you won't be visited by cephalopods this year? Sort of the mythos equivalent of begging for coal in your stocking? The Elder Sign never actually protected anyone from anything. That's Derleth's nonsense, not HPL. Brandishing an Elder Sign is more akin to taunting, which only insures visitation. In this respect, Derleth did a great deal of harm. Indeed, the five-pointed Elder Sign he drew, that most are familiar with, isn't the sign HPL drew. Then again, if I worked for cosmic horror, and my name was Derleth, the first thing I'd do was redraw some publicist's Elder Sign and say it does a bunch of stuff it doesn't do. My best friend and her husband bought me that very same Charlie Brown Christmas tree. You're making me want to start my own holiday. Now I want to decorate my tree like that! I'm hoping it becomes a commonplace sight. Blessed Solstice, and a Multitude of Wishes for a Bow Tie Cephalopodmas tree! That is a wonderful tree, (I didn't know they even made a Charlie Brown Christmas tree). The painting looks quite intense, thanks for sharing. I hope your trip to the sea brightens your day. It has been. I've been working on it over a year now. Here's wishing you and Ms. Spooky a lovely Solstice/Cephalopodmas. So glad you're taking a vacation and self-medicating. I'll toast the Solstice with an old friend; a raise of the glass to you and Spooky, as well. Happy Solstice and Cephalopodmas to you and Spooky! The tree is the bow tie-iest tree in all the land. The tree is the bow tie-iest tree in all the land. Hence, Cthulhu did not drive us mad last night. How can you be sure...? Lovely photographs. I want the cookies. And the painting. Also, a fine Cephalopodmas to you, Spooky, and the cats. I think this one disturbs me too much to ever let out into the world. 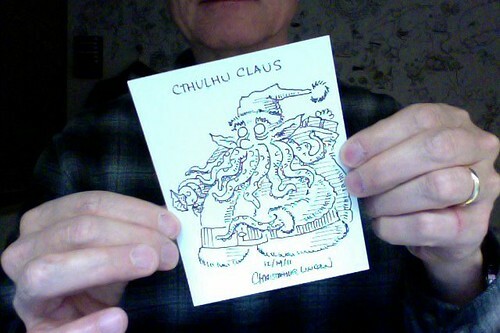 Apropos for the celebration of Cephalopodmas, Cthulhu Claus! Drawn by author Christoper Lincoln of the 'Billy Bones' series. Adorable! And tahnk you for the link! There was also a charming illustration, but it wasn't featured online. Sometimes I really love living in Portland! Sometimes I really love living in Portland! We have considered it. Kathryn once lived there. It is very, very nice here, but winters are dark and wet and seem to go on forever. I like that sort of thing (except for the chilly temperatures), but many do not. Merry Solstice, Felix Cepholopodmas as well. I know something is coming for you in the mail; I'm still trying to negotiate exactly what do to for Spooky, so that will probably be late. Unforunately, I don't think I'll be in game for Rift tonight, too much last minute secular holiday shopping and an early day at work tomorrow. Still, I hope your celebration is warm and relaxing. I know something is coming for you in the mail; I'm still trying to negotiate exactly what do to for Spooky, so that will probably be late. Actually, I cancelled RP tonight. So, now worries. You are of a certain most welcomed. Merry Cephalopodmas to you and Spooky! Now I have Cordelia's Dad's version of "Idumea" in my head (which is not a bad thing). If you or passing readers know not whereof I speak, it autoplays as track 1 here (http://www.timeriksenmusic.com/howcanisleep/). Thanks for the link to the HPLHS Solstice music. I was in a pretty crappy mood and listening to "Blue Solstice" made me feel a little less crappy. That is a terrific Cephalopodmas tree. Thank you for the photographs of Idumea. Happy Solstice and a Most Gibbous Cephalopodmas to you both. Happy Solstice & Cephalopodmas to you, Spooky, Hubero and Smeagol. Have only played the old Bioware console SW:tOR games, not the online one -- but it induces dreams of changelings and chickens? What am I missing out on here??? Do tell. Winter solstice is always a kinda sad for me, because I love the cold and dark season and it's going away now. But virtually everyone I know or meet is miserable then, and so I am happy for them.